Whatever a man sees in the world arouses fear in him. Detachment alone can free him from fear. Failing to grasp this profound truth, man is allowing his desires to multiply, without realising that desires promote attachment instead of detachment. As long as man is attached to the body, he cannot get over the desire to possess the objects that attract him. A man afflicted with the acquisitive impulse can never get rid of worries. To overcome this attachment and possessiveness, ancient sages tailored their educational system so that it promoted self-control. Self-control also developed humility and thus, humility became the true index of right education. Control of the senses is absolutely essential for achieving humility, and education must promote such control. Today's educational system is concerned mostly with imparting bookish knowledge, and students seek education only as a means for earning a living. This link between education and employment has to be severed, and education must instead be transformed into the process of acquiring True Wisdom. In life, there are two aspects that have to be considered, rights and duties. Most people are concerned only with their rights and engage in struggles to secure them. Seldom do they recognise their responsibilities. This is true of all fields of human activity - social, political, economic and even spiritual. Lack of self-control is responsible for all this. Men should regard their senses as potential enemies and not allow senses to have their own way. They should be subject to one's control and direction. What is the easiest way to achieve this mastery? Only the spiritual path. If there is real faith and devotion in man, the senses would be powerless against him. It is the decline in faith and devotion that has led man to become a slave of the senses. The prompting of intellectual reasoning should not be identified with the dictates of the Conscience. Rather, the directives should come from the Heart. When you dive deep into a problem and enquire whether what you do is in the interests of your friends and Society in general, your Conscience will give you the right answer. Man is made up of three constituents, the body, the Mind and the Atma. Man needs the body for performing actions. But, if the actions are done without using the discriminating power of the Mind, man would be behaving like an animal, which acts on impulse. Moreover, if the Mind, without relying on the eternal and ever pure Atma, follows the demands of the body and the senses, the actions would be demonic. 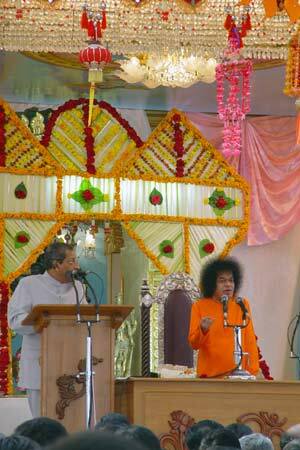 Bereft of the influence of the Atma, the combination of the Mind and the body can lead to demonic qualities. However, when one is installed in the Atmic principle, transcending the body and the Mind, one attains the Divine. Hence, sanctify all your words, thoughts and deeds. Make your Heart pure so that it becomes a worthy abode for the Divine.